When being an nerd and a foody collide. So about a year ago I was watching and anime called Pandora Hearts and at the beginning of the first episode the characters are eating an apfelkuchen. I thought to myself,”What is that……???”. I looked it up and it turned out it was apple cake! How tasty would that be?! I was so excited to try it out I found some recipes and flagged them for later. I was going to pick up some supplies to make it when I was next paid. Well that was my intention anyway. I would look at the recipe from time to time, thinking I would get to it…once I had this kind of sugar….or that kind of pan. Well, a year later, along come a resurgence in my love for baking and cooking and after a while I remembered that I had wanted to make this cake/bread that had looked like such a delicious idea. I started by researching recipes and seeing what fit best for what I wanted to make. I have these little cake molds that I really wanted to use and I thought they would work perfectly for something like this. 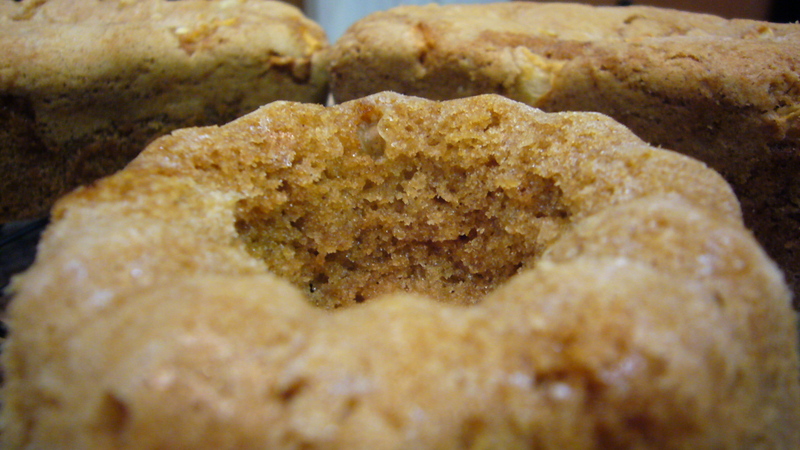 As far as ingredients goes, I was so surprised to find out how much sugar was used in apple cake. Also I most of the recipes used oil as fat and not butter. I could not make out why this was but when I eventually settled on a recipe that I thought would work, I was happy with the results when I used oil. 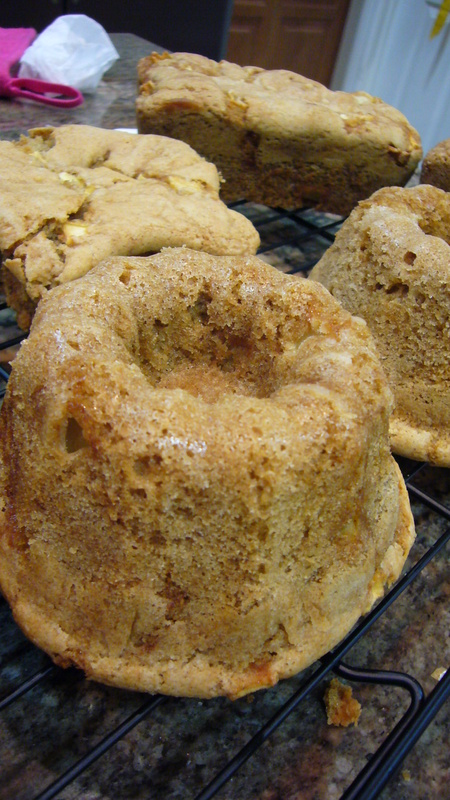 The apfelkuchen after it was removed from the molds. I have these really cute cake molds that I’ve collected over the years. I always seem to forget that my starts take a lot of prep to make sure that cooked batter will come out of the mold. It works best if I line the pan with parment paper cutouts. Of course is had been such a long time since I had used them, that I had forgotten this weeeee little step. The result was that I was only able to salvage 2 of the little stars out of the four that I made. 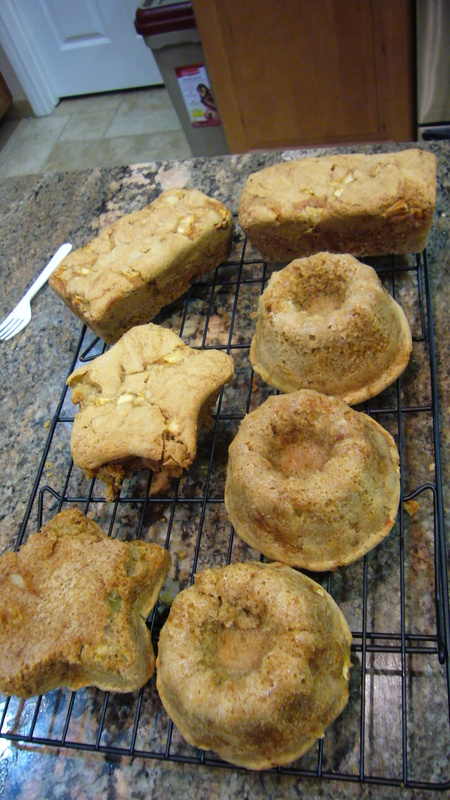 The Apple Bread was really hard to remove from the molds that I chose. The crust on the bread was so crunchy! I might change the apple I use next time. or remove the apple skins. I am not sure about the texture of the apples with the skin on. The Apple bread had the most delicous crust on the outside! It was almost the texture of a cookie. The recipe I followed was a Apple Bread Recipe. I knew that it was not a traditional apfelkuchen which is more like a cake, but this recipe worked for what I wanted to do. I had to change the cooking time as I did not use the same baking container. The amounts of the ingredients all remain the same. I will most definitely make this again and I’m so happy that I received that bit of inspiration from my super nerdy hobby! ← The 2nd 8th Annual Grill Cheese Invitational! I love Pandora Hearts! OMGOSH! It looks so yummy! I want to try this. Also I started watching Pandora Hearts again! Thank you so much blog.